The April meeting of the Goschenhoppen Historians will feature a presentation by Ms. Del-Louise Moyer, a historian and Fraktur specialist, entitled “An Old Goschenhoppen Geburtsschein.” While researching old records of the Old Goschenhoppen Church in Woxall, Ms. Moyer encountered a previously undocumented manuscript Geburtsschein (birth certificate) for Killian Gaugler, born 1725 in upper Salford Township. 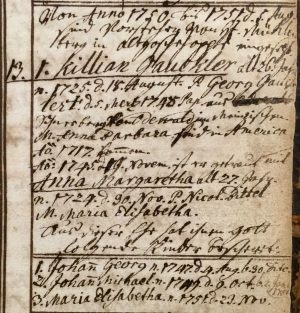 Her research led her to believe that the scrivener was Lukas Rauss who was appointed as a teacher to the Old Goschenhoppen Union church in 1751 by Henry Melchior Muhlenberg. Among his duties Mr. Rauss began keeping the church records, detailing its beginnings and the founding officers and members. Among them were the Gaucklers, Gabels, Schneiders, Deers, Langes, Nusses, Kleins, and Berkheimers, to name a few that to this day have local descendants. In a brief ceremony prior to Ms. Moyer’s artfully presented Power Point program the Historians will honor two recipients of this year’s Award of Merit for their contributions to the preservation of Pennsylvania German folk culture. The awards are framed Fraktur certificates commemorating the event and the many outstanding contributions the recipients have made to document and keep alive the traditions and folk culture of the Pennsylvania Dutch in the Goschenhoppen region. To learn who are this year’s Merit Award winners and to enjoy Ms. Moyer’s well illustrated program attend the meeting at 7:30 PM on Thursday, April 19, 2018 at Red Men’s Hall, the Goschenhoppen Historians headquarters, located at 116 Gravel Pike (Route 29), Green Lane, PA. There is no fee and the public is welcome to attend. Refreshments will be served during an informal get-together at the conclusion of Ms. Moyer’s talk. More information can be obtained at 215-234-4119.